Nergard is the brainchild of multi-instrumentalist and melodic rock wunderkind Andreas Nergård, and what we have here is a pair of download singles taken as tasters from the forthcoming album ‘A Bit Closer To Heaven’, with Nergård himself handling drums, bass and keyboard duties and a number of special guest musicians turning in performances as each song requires. 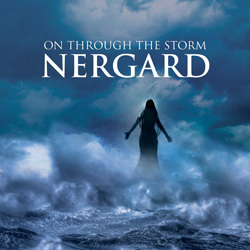 Issued a couple of weeks apart, the two tracks ably illustrate Nergård’s ability to write catchy, memorable songs. The first release ‘Fall From Grace’ is a beautifully performed slab of melodic pop-metal which features the stunning voice of Thomas Løseth; if you picked up Nergard’s ‘Intermission’ EP last year he was the vocalist on the U2 cover ‘With Or Without You’. The song’s not unlike something Bad English might have come up with, but a punchy mix drives it along and complementing Løseth’s work Andi Kravljaca’s backing vocals float hauntingly in the, well, background. ‘On Through The Storm’ is more a traditional, powerfully heart-rending ballad which boasts a terrific chorus belted out by vocalists Elize Ryd (moonlighting from her day job in Amaranthe) and (this time around) joint vocalist Kravljaca. As with ‘Fall From Grace’ Henrik Karlsvik provides guitar duties, and the ever-reliable Jørn Viggo Lofstad from Pagan’s Mind pops up to nail an understated but just-the-job solo. Two great cuts which bode well for the album, due out later in the summer.